We both know that a Microsoft Exchange Server doesn’t have feelings, hopes and desires. But when we write technical documents, these type of human feelings can creep in. You need to be careful when writing user guides, design documents, and specifications as these false words give the wrong impression and undermine the quality of your material. Have you struggled with job position names and titles in your policies and procedures (P&P) content? 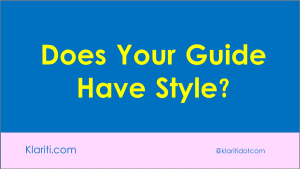 Here are several style rules to follow. Read article. I have three style guides in the office and have now added this from the BBC. The BBC Style Guide represents some of John Allen’s extraordinary wisdom surrounding the use of English in written and spoken communications. Fix conversion issues with Word 2007 by downloading this patch from Microsoft Office site: http://www.microsoft.com/downloads/ This 2007 Microsoft Office system update fixes conversion issues that occur with Microsoft Word documents.